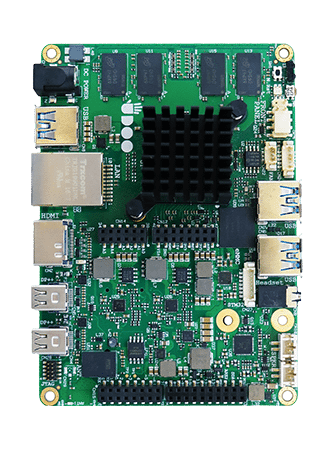 UDOO X86 is the New PC: the most powerful maker board ever and an Arduino™ 101-compatible platform, all embedded on the same board. On UDOO X86 you can run all the software available for the PC world, from gaming to video streaming, from graphical editors to professional development platforms, plus all the software for the Arduino™ 101 world, including all the sketches, libraries and the official Arduino™ 101 IDE. While the X86 Braswell processor can run all the Windows, Linux, Android X86 64bit Distros you want to use as desktop PC, the Intel® Curie™ allows easy access to a Arduino™ 101 environment. Download the User Manual to have more complete explanation of the UDOO X86 hardware. Visit the Get Started X86 section of the UDOO website to find video tutorials of how to start use the UDOO X86 board. Never provide more than 3.3V in input to the GPIOs of the Arduino 101(Intel® Curie™), and never provide more than 1.8V in input to the GPIOs of the Braswell processor. Power the board with a stabilized power supply (DC-jack with a standard 5.5mm/2.1mm barrel jack, internal positive, Voltage 12V ± 5%, at least 3A). Do not use a NON-standard USB 3.0 peripheral. If you use a non-standard USB 3.0 peripheral with an external power plug, this could send back the power source to the UDOO X86 board with the risk of damage. UDOO X86 retail line up consists of two models. 12V (± 5%) DC Power Jack (standard 5.5mm/2.1mm barrel jack: internal positive), at least 3A. Visit the official accessories sections. The forum search facility has been tweaked to allow more general searching. Please do a search before making a post as the issue may already have been raised and answered. There is an (unofficial) UDOO discussion channel on IRC. Using the IRC client of your choice, use server information: irc.freenode.net. Room name is #udoo.